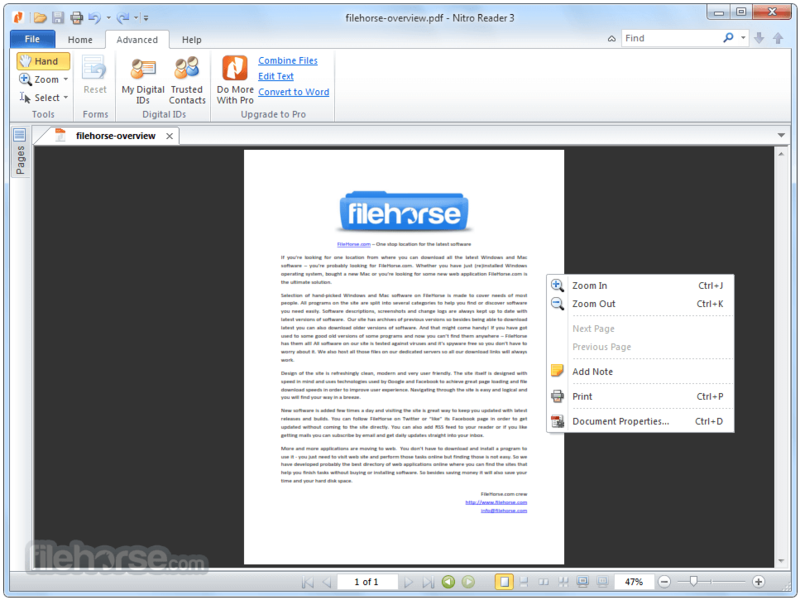 Nitro PDF Reader allows you to create PDF files from over 300 different formats. Comment, review, and collaborate. Fill and save PDF forms. Extract text and images. Add a scanned image of your signature and use QuickSign to electronically sign and return documents in seconds. Nitro PDF Reader utilizes the Microsoft Office-style Ribbon interface, The Quick Access Toolbar (QAT) allows you to create an easily accessible group of shortcuts to the tools you use most frequently. 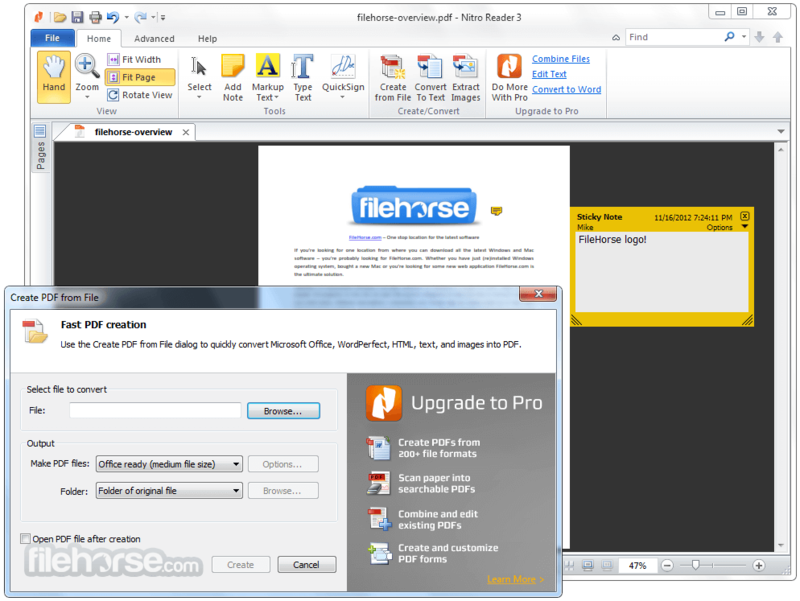 Nitro PDF Reader offline installer for PC offers navigation panes, including Pages, Bookmarks, Comments, Output, Signatures, and Attachments, allowing for easy navigation of larger documents, and providing a central location for additional content. Create PDFs from virtually any Windows application. 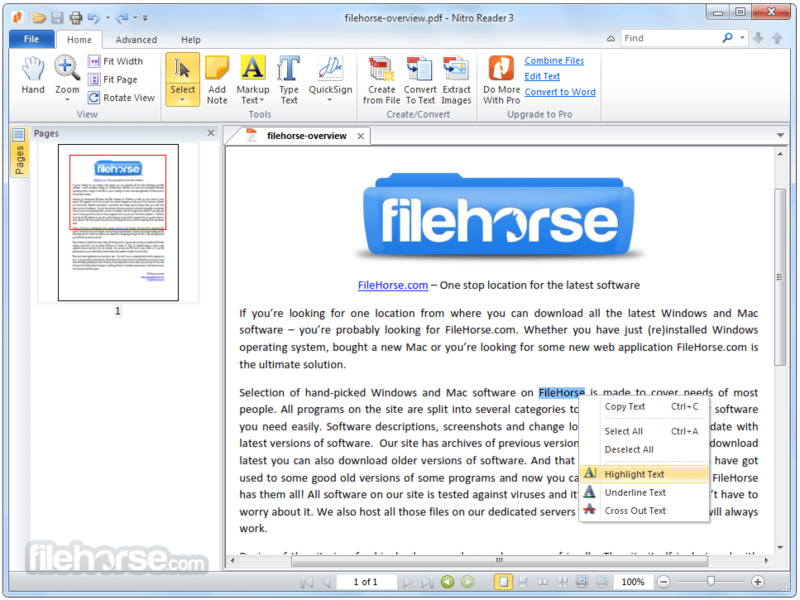 Convert any printable files to PDF directly from the source, or within Nitro Reader. Nitro PDF Creator, a virtual print driver, lets you print directly from your favorite applications. 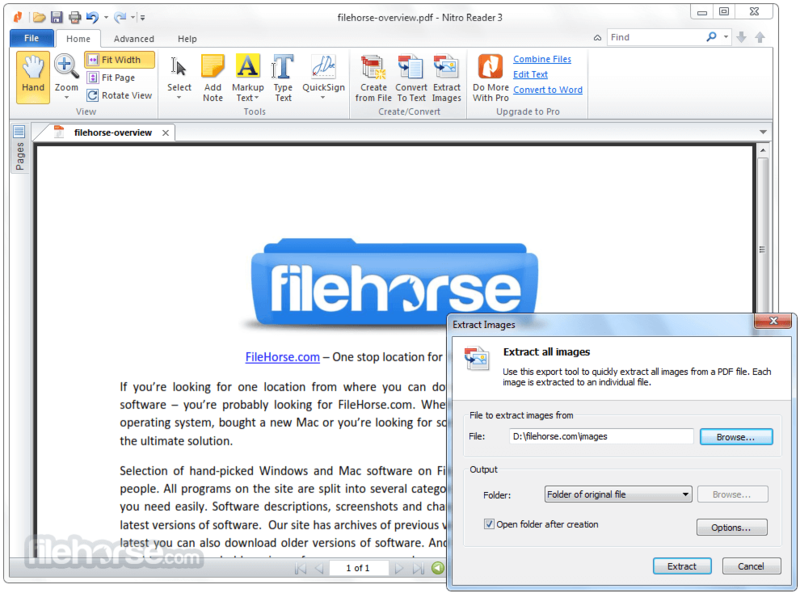 You can drag any file onto the desktop icon to instantly create a document. All PDFs created with Nitro Reader are 100% compatible with other leading PDF readers and editors. So you can share them securely with anyone, anywhere. Nitro Reader is designed for users, by users. Features you wouldn't even expect in a free product are right where you'd want them to be. So stop guessing and start doing. The ‘Ribbon' interface separates tasks and tools intuitively, and they're arranged the way you actually use them. Hover over buttons and handy tips appear, so you always know exactly what you're doing. Digital documents are transforming the way it work together, yet genuinely useful collaboration tools have never been available in a free PDF reader. Until now. If you’ve filled out PDFs that need signing, bet the only way to save them was to print first, sign them by hand, and then scan them back in again. Nitro Reader lets you sign any kind of document in seconds— without leaving your desk.